TataSky has launched a new app for all smart phones which features Social Network, TV Remote as well as allows users to share what they are watching at the moment. For showing off this app TataSky made a TV commercial featuring Aamir Khan and some others making a cool advertisement. The screen play of the advertisement is pretty good but there is one glitch! 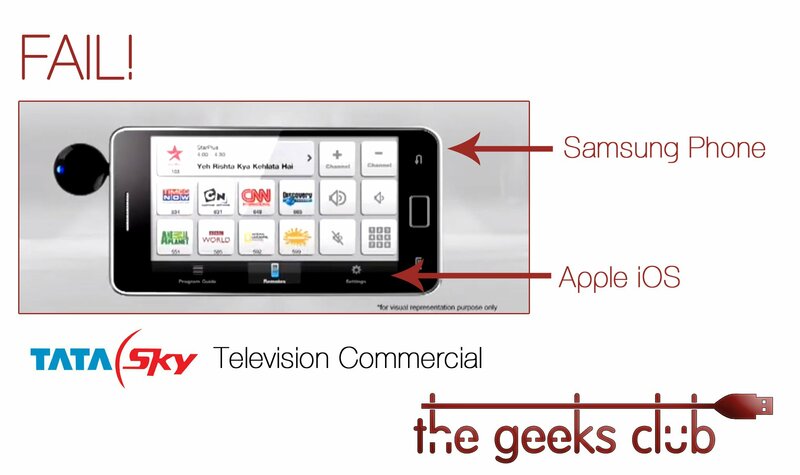 TataSky has demonstrated the Android app on a Samsung device with an iOS user interface! That’s the biggest “FAIL!” from TataSky till now. I have no idea why they did not use the same operating system which Samsung Phone features! Android would have been better since it’s open source. Merging a device designed for Android with iOS from Apple is total careless and completely open to ridicule, esp among the geek crowd!. In spite of all this the advertisement clearly mentions “*Available on the iTunes App Store. Coming soon on Android.” at the end of the advertisement. Have a look at this picture, The phone is designed by Samsung it could be Galaxy S II, Galaxy Ace or Galaxy SL but the user interface is Apple iOS. Ahem … this is not what we would expect from a company like Tata Sky. If Tata Sky personnel thinks that Indians are so dumb that they can get away with anything they are highly mistaken! Tsk, tsk … Tata Sky!